Today marks the beginning of what is likely to be a closely watched courtroom battle—the murder trial of George Zimmerman for the fatal shooting of 17-year old Trayvon Martin in Sanford, Florida on February 26, 2012. While there has been ongoing coverage of the case and the run-up to the trial, it may be hard to remember just how big—and polarizing—the racially charged story was when it broke more than a year ago. 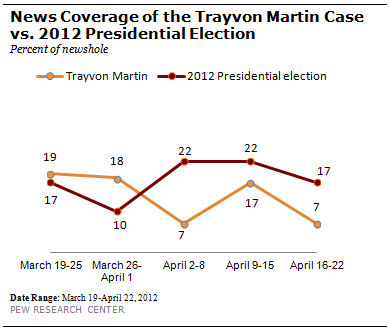 In the five years that Pew Research Center tracked weekly news coverage (January 2007-May 2012), the Martin killing received the highest level of sustained coverage of any story with a major racial component. And public interest in the story broke down along racial and partisan lines, with blacks and Democrats paying much more attention to news about the case than whites and Republicans. While the shooting death of Martin quickly began generating attention on social media, mainstream media coverage started slowly, taking several weeks after the February 26 killing to build. According to our data, the Martin case emerged as the No. 1 story in the mainstream press the week of March19-25, 2012—following the release of Zimmerman’s 911 calls. That week, it accounted for 19% of the newshole, making it the first story in 2012 to generate more coverage in a single week than the presidential campaign. (The term newshole refers to the space devoted to each subject in print and online and time on radio and TV.) At that point, about one-third of Americans (35%) said they were following news about the case very closely, making it one of the top stories in 2012 in terms of the level of public attention. It is also clear that public interest in the story split along both racial and political lines. A Pew Research Center survey found that from March 29-April 1, 2012, 58% of African-Americans said the Martin case was the story they were following most closely, compared with just 24% of whites. At the same time, twice as many Democrats (38%) as Republicans (19%) said it was the story they were following most closely. A similar split was seen over the quantity of media attention, with whites and Republicans far more likely to say there was too much coverage (43% and 56%, respectively) than blacks (16%) and Democrats (25%).